Transfluent (www.transfluent.com) is a Helsinki based translation service that focuses on blog and social media translation. Their anchor product is a service that enables you to multi-cast your Facebook posts and Tweets in over 60 languages. The translations are done within minutes by professional translators. The company has recently expanded its offerings to include a Word Press plugin, mobile app localization, and a very nicely designed REST web API for software developers. Word Press translation plug in : simply add this plug in to your website, and your blog posts will be professional translated into the languages you select. Mobile app translation : similar to offerings from companies like Traducto, this tool enables you to quickly extract prompts from your mobile application and app store to be professionally translated in one easy to manage package. Translation API : Transfluent has joined the ranks of translation companies that offer a simple and well documented REST API for software developers to embed translation into virtually any application or workflow. Transfluent itself is not a translation agency, but instead appears to act as an aggregator to front-end a number of translation service providers, such as Gengo. Transfluent monitors your Twitter feed or selected Facebook pages, and then translates posts into the languages you have configured. The entire process is automated, so you can just post to your social media feeds. Translations are typically completed quickly, sometimes in just a few minutes (turnaround time varies by language and time of day). The company offers several tiers of service, with an entry level Facebook translation package that is priced at $99 per month for 20 posts (30 words per post). This works out to about 17 cents per word, which is right in the mid-range of what professional translation services typically charge (and very few are set up to deal with short message translation, and almost none are integrated with Facebook and Twitter like this). In short, its quite fairly priced, and makes it easy to extend the reach of your social media posts. 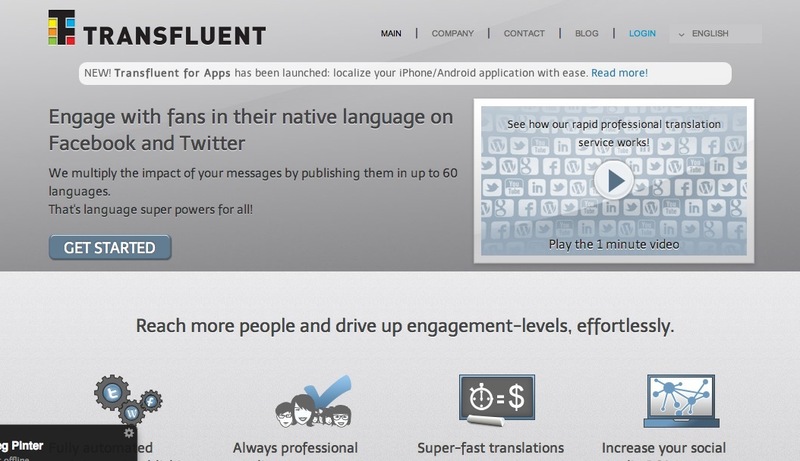 Transfluent has pioneered the development of social media translation tools. If you’re looking for tools to interact with an international audience on platforms like Facebook, Twitter or Word Press, they’ve developed a best in class solution. The API based translation service is also interesting, especially if it allows you to choose from several upstream providers, or selects the best quality option for each language. We are doing further research to find out exactly what their API based service is doing, and will update this review when we hear back. Gengo and SpeakLike both provide social feed translation as a service, but do not focus on this market specifically. Transfluent has established a unique position for itself as a specialist in this market, so while they have competition, they’ve clearly thought through the problem in detail compared to general purpose service providers. This entry was posted in APIs, game localization, localization, mobile app localization, social media translation, translation agencies and tagged socialmedia, transfluent. Bookmark the permalink.